Duke, USC, Cornell, and eight more teams we hate in this year's NCAA Tournament. Duke, USC, Cornell, and eight more odious schools in this year’s NCAA Tournament. If history is our guide, 64 teams in the 2008 NCAA Tournament believe the fans, critics, and concessionaires aren’t giving them enough respect. There’s one team, though, that thinks the exact opposite. In recent years, coach Mike Krzyzewski, guard- poet J.J. Redick, and forward- faux businessman Christian Laettner have confessed to reporters the terrible burden that the Blue Devils must bear: Duke always gets the other team’s best shot. Complaining that you get too much respect, that the NCAA’s junior associates have the gall to try to beat you, is the quintessence of Duke basketball. I believe psychologists refer to this as narcissistic personality disorder. Hate is not a word I would use to describe Baylor, the red-brick university conveniently located mere yards from Interstate 35 in Waco, Texas. As any Big 12 alum will tell you, playing the Bears, who hadn’t made the NCAA Tournament in 20 years, inspires a different emotion: fear. Fear of losing to a massively inferior opponent, fear of bowing before the runt of the conference. This season, after Texas A&M dropped a five-overtime game to the Bears, the Aggies were serenaded with chants of “worse than Bay-lor!” by opposing fans. The joke was that such a fate was unimaginable. Everyone bags on Big Ten football, and appropriately so, but the Midwestern brand of pigskin is easy on the eyes compared with Big Ten hoops: a raft of mediocre teams, plenty of flow-restricting physicality, and, all-too-often, Brent Musberger, looking live from Champaign or Iowa City. The most painful Big Ten team to endure is the Badgers, a team that combines brutishness and blandness into an unwatchable goulash. The team nickname is Big Red. Do you have that annoying jingle in your head yet? How about now? Three of the university’s colleges receive significant state funding. As a New York taxpayer, I am thus subsidizing a sure loser. I wouldn’t mind ponying up for a contender, but having drawn Stanford in the first round, Cornell can’t even claim academic superiority. 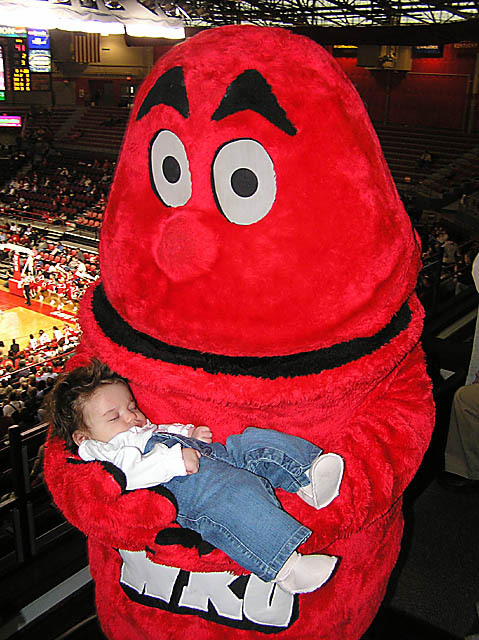 The worst hardship the Big Red has overcome this season: prolonged exposure to the team bus. Last week, the AP noted that “[t]he road to the NCAA tournament is especially difficult for Cornell” because players have to “endure long bus trips.” Just imagine: Some players had to listen to their iPods for as many as four consecutive hours. When discussing the team in print or conversation, it appears mandatory to mention that sophomore guard Ryan Wittman is the son of Randy Whitman. Which raises an inevitable question: Who is Randy Wittman? Arizona will play in its 24th straight NCAA tournament this week, the longest active streak. That’s one too many. In the last three weeks, the Wildcats are winless against everyone but Oregon State, a historically awful bunch of losers that hasn’t put up a fight since challenging the Washington Huskies to a duel in a hotel parking lot. It’s tough enough to deal with UGA’s obnoxious, thin-skinned fans during football season. Now, thanks to a miracle run to the SEC Tournament title, the Athens contingent has something else to crow endlessly about. Because a tornado rendered downtown Atlanta unfit for frivolity, the Dawgs did the deed in the home gym of its arch-enemy, Georgia Tech. Suffice it to say, Hotlanta will never hear the end of it. Georgia fans are so self-righteous, they probably believe the twister (which I heard but didn’t see, if you’re curious) was sent by the Lord hisself to facilitate the unlikely championship. I prefer to blame Tennessee and Vanderbilt, the conference’s two best teams, for gazing toward the bigger tournament that starts this week, thus helping a team that won four conference games all season win four in three days and the SEC’s automatic tourney bid.